For 40 years, IEEE's INTELEC® (International Communications Energy Conference) has been the premier international technical forum where the science and engineering of energy systems for communications networks is canvassed amongst academia, industry and infrastructure operators. 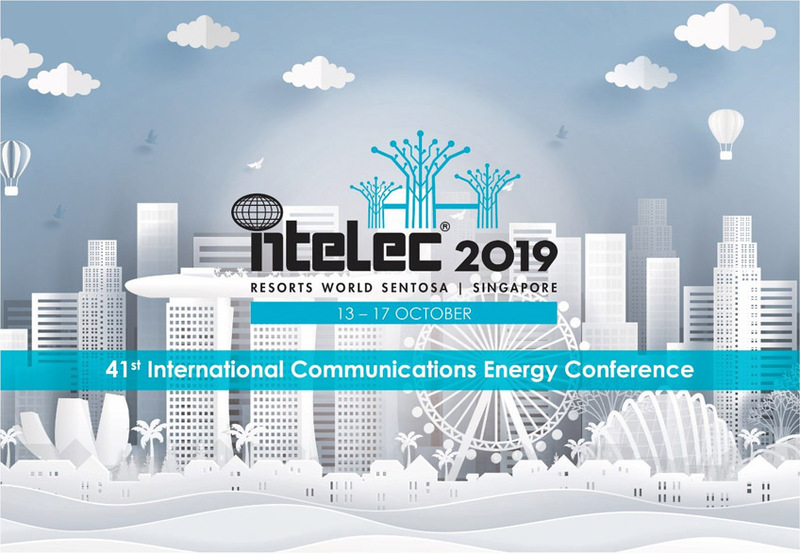 The 41st annual edition of INTELEC® takes place 13-17 Oct, 2019 at the Resorts World Sentosa in iconic Singapore. This is the first time INTELEC® will be in the South-east Asia region. The theme for INTELEC® 2019 is Tackling the challenges of powering ICT infrastructure. 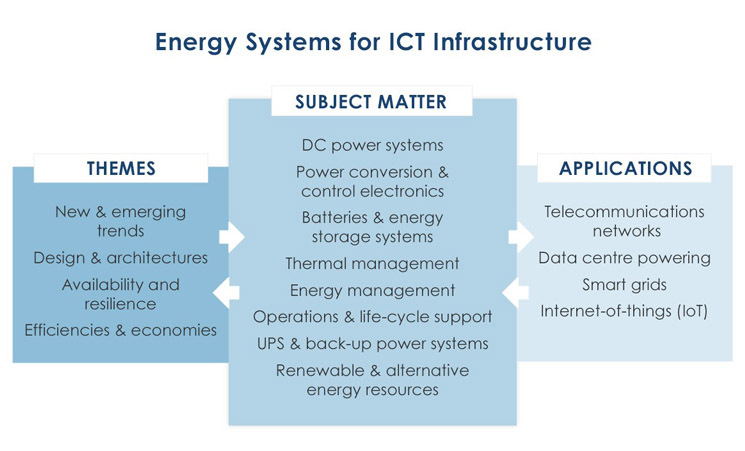 There is an artisan component in the discipline of providing highly-available energy to power information and communications technologies (ICT) systems. Telecommunications requires electricity. Back-up power schemes involving redundant power conversion, energy storage, and distribution schemes have traditionally been used to prevent communications service loss in the event of failure of the primary source of electricity. The reporting of research and development in power conversion electronics, energy storage, such as batteries, and power system architectures are core to INTELEC®. But digital convergence has greatly changed the traditional landscape and ICT networks have evolved into highly distributed systems in which there is no direct electrical connection between the edge network elements and the central facilities. Digital communications are now ubiquitous, and digital communications networks and information hubs continue to expand and grow throughout the world. The growth is energy hungry and the demand for new energy to support information and communication technologies has continuously been increasing. This growth has been, in a great part, motivated by society's increased dependence on ICT networks. Hence, society expects that quality of service remains unchanged even during abnormal operating conditions caused by a disruptive event. But as the value of the content of digital transmissions increase, so too does the dependency on the availability of the energy systems supplying the network. The electrons must be there when they are needed. For instance, 5G is seen as a catalyst for enabling a bold new future of an Internet-of-Things (IoT). However, 5G will be more highly distributed than previous cellular networks, and due to expected human-machine and machine-machine interactions enabled by 5G, there is an implicit need for power supply availability and resilience higher than with current networks. Legacy architectures and networks will exist for many years throughout the world and operators must find ways to ensure practical interoperability. Emerging concepts with local (low power) generation forming DC nanogrids and wider-area microgrids creating district energy systems, integrated with the distribution networks of the traditional AC electricity grid are areas of current research. At the same time, developments in power conversion electronics and batteries provide new opportunities to better manage and extend legacy powering infrastructure. INTELEC® is the place to report, share and discuss such ideas and developments. If you are working in any of these areas, please submit a paper or poster. Digests for peer-review selection closes on 8 April 2019. Notification of acceptance by 31 May 2019, and accepted full papers are required by 15 August 2019. Technical papers and posters presented at INTELEC® 2019 will be up-loaded to IEEE Xplore (subject to IEEE rules). If you have not already received the call for papers, go to www.intelec2019.org for full details, and ensure you register on the mailing list. INTELEC® 2019 is a full technical conference with an associated Industry Exhibition to showcase the latest in power conversion equipment, energy storage options, and system integration designs for ICT energy systems. INTELEC® is where you will meet colleagues in the same field, exchange ideas and hear from academic and industry leaders about important emerging trends and developments. INTELEC®'s long success is linked to the structure of the Industry Exhibition where academia & researchers, industry product developers and vendors, end-users and infrastructure operators mix and network throughout the conference. 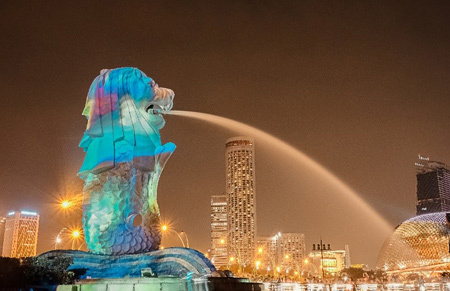 If none of the above is enough, the lure to go to INTELEC® 2019 then must surely rest with the location - iconic Singapore. If you have not been to Singapore, maybe use INTELEC®2019 as your excuse to get there. It is truly a magnificent modern city, with impressive architecture, and full of very friendly and welcoming Singaporeans. 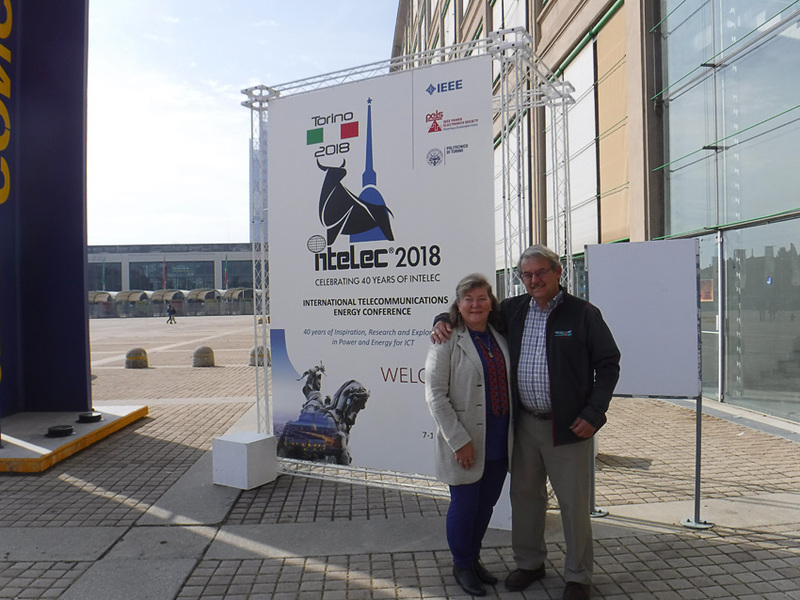 he 40th anniversary INTELEC 2018 conference was held in the beautiful and historic city of Torino, Italy at the Lingotto Conference Centre on October 7-11th. The theme of this conference was; 40 years of Inspiration, Research and Exploration in Power and Energy for ICT. The conference informed upon and debated the growing issues facing society with powering Information and Communications systems. The conference was opened with a special presentation by Dr. Alan Mantooth, president of the conferences' sponsor PELS, the Power Electronics Society of the IEEE. Dr. Mantooth talked about the importance of Power Electronics in today's society and the role that Wide Bandgap Power Devices will play in the future expansion of power electronics into more areas including increasingly higher voltage and higher power applications. The percentage of the world's electrical energy that is converted by power electronics is increasing dramatically! The first conference Keynote speaker was Professor Giovanni Colombo, Conference General Chair and former research Chief of Telecom Italia and European Institute of Innovation and Technology. Dr. Colombo in his presentation, "Energy and ICT, a Reciprocal Transformative Challenge", highlighted the increasing need for Engineers to act in a responsible manner to the effects of our work on the environment and our society. In particular, he talked about the increasing amount of energy being consumed by Information and Communications Technology, the positive and negative effects of this technology on society and the very real negative effects on the environment, noting that this is a challenge that Engineers should be aware of and should work towards resolving. In keeping with the conference theme, Dr. Norbert Grass, of Ohm University and Grass Power Electronics GmbH, presented the second keynote on the 40 year history of INTELEC, highlighting the first conference in Washington DC and noting the issues in power systems, power conversion, and energy storage for (tele)communications that were discussed in the technical papers of the first INETELEC and how little the topics have changed since, despite the great changes in technologies. He also talked about the people, such as Joe Suozzi and Nicolas Osifchin, that conceived the idea of an international conference on communications energy systems in 1975 and others such as Gunther Vau, Robert Jurewicz and Christopher Riddleberger that contributed greatly to INTELEC and also on the influence that INTELEC has had on the development of communications power and energy components and systems over the years. The conference plenaries included an informative presentation on 5G cellular communications systems and 5G powering by Tao Hongming of Huawei, discussing the issue of the huge amount of power that will be needed to operate the dramatic proliferation of cell sites required to fully implement the upcoming 5G systems, and the issues with assuring that this power is reliable to allow 5G communications to meet it's potential, for example, reliable machine to machine communications. The plenaries also included an interesting presentation on the Challenges and Opportunities of Battery Technologies by Dr. Noshin Omar of Vrije Universitiet in Belgium, who gave a high level overview of the various technologies and their possibilities. Workshops are also a very important part of INTELEC and 2018 did not disappoint in this area. A workshop on Remote Line powering of Telecommunications Equipment hosted by Victor Goncalves of Alpha Technologies and an international panel of five other experts informed on the various remote line powering standards, issues, methods and applications. It appears this technology is catching on and is a candidate for powering smaller 5G cell sites. A workshop on the 5G network, the Powering (R)evolution was hosted by Favio Cucchietti, an independent consultant in Italy, indicated that 5G is still evolving and that there are still a lot of unknowns. One of the limiting factors is the concerns powering 5G networks. The program also included four tutorials on the Sunday before the conference opened, three parallel technical sessions with about 100 oral presentations on power systems, power electronics, energy storage and renewable energy generation and poster presentations. There was also an industry exhibition featuring 25 exhibits on communication power and energy systems equipment. The conference, as always for INTELEC, featured a substantial social program which including a welcome reception at the conference hotel on Sunday evening, an exhibition reception on Monday evening, an afternoon social bus and walking tour of the city, and a banquet on Wednesday evening at the magnificent MAUTO National Car Museum which featured, along with all cars from the first steam driven ones to the latest Ferraris, a local youth orchestral ensemble as excellent entertainment. Finally, on the Thursday afternoon after the conference closing session, there were two optional technical tours to choose from; a visit to TILabs, TIMs Development and Innovation Center and a visit to INRIM, Italy's national metrology institute. Both tours were well received by those that attended. The attendees greatly enjoyed the host city, Torino. The hospitality was great and all enjoyed the local Italian food and wines very much. 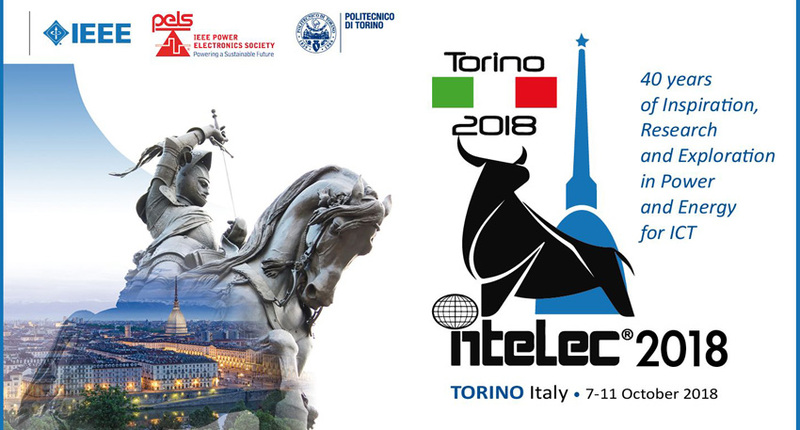 Many thanks go to the Local Organizing Committee headed by Professor Michele Pastorelli and Mariapia Martino and to the sponsor IEEE PELS, The Politecnico Di Turino, the supporters and exhibitors, and all attendees for assuring the success of the conference. The next INTELEC conference will be in Singapore the 13th to 17th of October 2019. One can join the mailing list for the conference and look for announcements on the conference website www.intelec2019.org. In May 1975, Messrs. N. Osifchin, B. J. Yokelson, and J. J. Suozzi of Bell Telephone Laboratories developed the idea of an international conference on telephone energy systems. During visits to England, Sweden, Holland, France, Germany, and Italy to discuss power for telecommunications, the idea of an international conference on telecommunications energy was discussed and gained favor with many telecom administrations. In March 1976, Bell Labs management granted permission to the founding team to work on launching such a conference, sponsored by an entity of the Institute of Electrical and Electronics Engineers (IEEE) and open to all, and the planning for the conference began. In November 1976 the plan for the conference was presented to the Meetings and Conference Department of the IEEE Communications Society (COMSOC) at a meeting in Philadelphia. COMSOC accepted the proposal and agreed to be the sponsor. The first conference was scheduled for October 25-27, 1978, at the Sheraton Hotel in Washington, DC with J. J. Suozzi as Chairman. The conference was called "The International Telephone Energy Conference" from which the term "INTELEC" was derived. In 1979 the name was changed to "The International Telecommunications Energy Conference," and the term "INTELEC" was retained. During 1977 and 1978, intensive plans were also being drawn to form a governing body for the conference. This was accomplished by 1978 with the formation of an INTELEC Advisory Committee, representing the world community and presided over by N. Osifchin. The first Advisory Committee meeting was held in October 1978, at the first INTELEC conference, and an immediate debate arose as to how often the INTELEC conferences should be held. A second INTELEC conference was planned for November 1979, chaired by W. M. Miller (Lorain Products), a Planning Committee (later becoming the Conference Executive Committee (CEC)) was mandated to prepare recommendations on the frequency and plans for future meetings and J.J. Suozzi was appointed to write a Constitution and Bylaws for the INTELEC organization. The second INTELEC conference was held with an even more enthusiastic turnout than the first and plans began for the first INTELEC conference outside of North America, with I. G. White of the British Post Office as Chairman, for May 1981. The success of the 1981 meeting led to the acceptance of the concept of an annual INTELEC conference. By 1986, the international character of the INTELEC conference was ensured by constitutional changes providing for a 50%-50% American and non-American balance of Advisory Committee membership and by acceptance of a six-year cycle with three meetings in North America, two in Europe, and one in Asia. In 1991, negotiations among COMSOC, INTELEC and the recently formed IEEE Power Electronics Society (PELS) resulted in an agreement to transfer sponsorship of INTELEC from COMSOC to PELS, where it joined the Applied Power Electronics Conference (APEC®) and the Power Electronics Specialists Conference (PESC®), which are also sponsored by PELS. Over its history, INTELEC conferences have been held in Washington, London, Tokyo, New Orleans, Munich, Toronto, Stockholm, San Diego, Florence (Italy), Orlando, Kyoto, Paris, Vancouver (Canada), The Hague, Boston, Melbourne (Australia), San Francisco, Copenhagen, Phoenix, and Edinburgh (Scotland). The 2002 conference was held in Montreal. Future conferences are planned for Yokohama, Chicago, Berlin, and Rome. After the fall of the Berlin Wall and the opening of Eastern Europe borders, there was a strong desire to hold telecommunications energy conferences in Germany and Eastern Europe. The Advisory Committee approved establishment of a smaller conference, the Telecommunications Energy Special Conference (TELESCON®) to address this need. The first TELESCON conference was held in Berlin in the spring of 1994. Additional spring conferences took place in Budapest in 1997 and Dresden in 2000. Continuing the three-year cycle, the next TELESCON conference will be held in Rio de Janeiro in June 2003. Recent conferences have included tutorial sessions in addition to the technical sessions. Experts in the subject matter conduct the tutorials, and attendees earn continuing education credits. Future conferences will undoubtedly cover new technologies to meet the evolving needs of the participants. Provided by J.J. Suozzi with inputs from Chris Riddleberger, Mark Jacobs and Michael Davis.